King Arthur legend what do we know / La leyenda del Rey Arturo que es lo que se sabe. King Arthur is a legendary British leader who, according to medieval histories and romances, led the defence of Britain against Saxon invaders in the late 5th and early 6th centuries AD. The details of Arthur’s story are mainly composed of folklore and literary invention, and his historical existence is debated and disputed by modern historians. Geoffrey depicted Arthur as a king of Britain who defeated the Saxons and established an empire over Britain, Ireland, Iceland, Norway and Gaul. In some Welsh and Breton tales and poems that date from before this work, Arthur appears either as a great warrior defending Britain from human and supernatural enemies. Many elements and incidents that are now an integral part of the Arthurian story appear in Geoffrey’s Historia, including Arthur’s father Uther Pendragon, the wizard Merlin, Arthur’s wife Guinevere, the sword Excalibur, Arthur’s conception at Tintagel, his final battle against Mordred at Camlann, and final rest in Avalon. The 12th-century French writer Chrétien de Troyes, who added Lancelot and the Holy Grail to the story, began the genre of Arthurian romance that became a significant strand of medieval literature. How much of this narrative was Geoffrey’s own invention is open to debate. Certainly, Geoffrey seems to have made use of the list of Arthur’s twelve battles against the Saxons found in the 9th-century Historia Brittonum, along with the battle of Camlann from the Annales Cambriae and the idea that Arthur was still alive. Arthur’s personal status as the king of all Britain would also seem to be borrowed from pre-Galfridian tradition, being found in Culhwch and Olwen, the Triads, and the saints’ lives. Finally, Geoffrey borrowed many of the names for Arthur’s possessions, close family, and companions from the pre-Galfridian Welsh tradition, including Kaius (Cei), Beduerus (Bedwyr), Guenhuuara (Gwenhwyfar), Uther (Uthyr) and perhaps also Caliburnus (Caledfwlch), the latter becoming Excalibur in subsequent Arthurian tales.However, while names, key events, and titles may have been borrowed, Brynley Roberts has argued that “the Arthurian section is Geoffrey’s literary creation and it owes nothing to prior narrative.” So, for instance, the Welsh Medraut is made the villainous Modredus by Geoffrey, but there is no trace of such a negative character for this figure in Welsh sources until the 16th century.There have been relatively few modern attempts to challenge this notion that the Historia Regum Britanniae is primarily Geoffrey’s own work, with scholarly opinion often echoing William of Newburgh’s late-12th-century comment that Geoffrey “made up” his narrative, perhaps through an “inordinate love of lying”.Geoffrey Ashe is one dissenter from this view, believing that Geoffrey’s narrative is partially derived from a lost source telling of the deeds of a 5th-century British king named Riotamus, this figure being the original Arthur, although historians and Celticists have been reluctant to follow Ashe in his conclusions. Arthur and his retinue appear in some of the Lais of Marie de France, but it was the work of another French poet, Chrétien de Troyes, that had the greatest influence with regard to the development of Arthur’s character and legend. Chrétien wrote five Arthurian romances between c. 1170 and 1190. Erec and Enide and Cligès are tales of courtly love with Arthur’s court as their backdrop, demonstrating the shift away from the heroic world of the Welsh and Galfridian Arthur, while Yvain, the Knight of the Lion, features Yvain and Gawain in a supernatural adventure, with Arthur very much on the sidelines and weakened. However, the most significant for the development of the Arthurian legend are Lancelot, the Knight of the Cart, which introduces Lancelot and his adulterous relationship with Arthur’s queen (Guinevere), extending and popularising the recurring theme of Arthur as a cuckold, and Perceval, the Story of the Grail, which introduces the Holy Grail and the Fisher King and which again sees Arthur having a much reduced role. Chrétien was thus “instrumental both in the elaboration of the Arthurian legend and in the establishment of the ideal form for the diffusion of that legend”, and much of what came after him in terms of the portrayal of Arthur and his world built upon the foundations he had laid. Perceval, although unfinished, was particularly popular: four separate continuations of the poem appeared over the next half century, with the notion of the Grail and its quest being developed by other writers such as Robert de Boron, a fact that helped accelerate the decline of Arthur in continental romance. Similarly, Lancelot and his cuckolding of Arthur with Guinevere became one of the classic motifs of the Arthurian legend, although the Lancelot of the prose Lancelot (c. 1225) and later texts was a combination of Chrétien’s character and that of Ulrich von Zatzikhoven’s Lanzelet. Chrétien’s work even appears to feed back into Welsh Arthurian literature, with the result that the romance Arthur began to replace the heroic, active Arthur in Welsh literary tradition. Particularly significant in this development were the three Welsh Arthurian romances, which are closely similar to those of Chrétien, albeit with some significant differences: Owain, or the Lady of the Fountain is related to Chrétien’s Yvain; Geraint and Enid, to Erec and Enide; and Peredur son of Efrawg, to Perceval. Up to c. 1210, continental Arthurian romance was expressed primarily through poetry; after this date the tales began to be told in prose. The most significant of these 13th-century prose romances was the Vulgate Cycle (also known as the Lancelot-Grail Cycle), a series of five Middle French prose works written in the first half of that century. 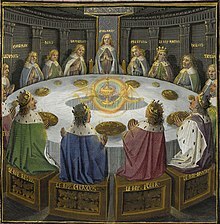 These works were the Estoire del Saint Grail, the Estoire de Merlin, the Lancelot propre (or Prose Lancelot, which made up half the entire Vulgate Cycle on its own), the Queste del Saint Graal and the Mort Artu, which combine to form the first coherent version of the entire Arthurian legend. The cycle continued the trend towards reducing the role played by Arthur in his own legend, partly through the introduction of the character of Galahad and an expansion of the role of Merlin. It also made Mordred the result of an incestuous relationship between Arthur and his sister and established the role of Camelot, first mentioned in passing in Chrétien’s Lancelot, as Arthur’s primary court. This series of texts was quickly followed by the Post-Vulgate Cycle (c. 1230–40), of which the Suite du Merlin is a part, which greatly reduced the importance of Lancelot’s affair with Guinevere but continued to sideline Arthur, and to focus more on the Grail quest. As such, Arthur became even more of a relatively minor character in these French prose romances; in the Vulgate itself he only figures significantly in the Estoire de Merlin and the Mort Artu. During this period, Arthur was made one of the Nine Worthies, a group of three pagan, three Jewish and three Christian exemplars of chivalry. The Worthies were first listed in Jacques de Longuyon’s Voeux du Paon in 1312, and subsequently became a common subject in literature and art. In the early 19th century, medievalism, Romanticism, and the Gothic Revival reawakened interest in Arthur and the medieval romances. A new code of ethics for 19th-century gentlemen was shaped around the chivalric ideals embodied in the “Arthur of romance”. This renewed interest first made itself felt in 1816, when Malory’s Le Morte d’Arthur was reprinted for the first time since 1634. Initially, the medieval Arthurian legends were of particular interest to poets, inspiring, for example, William Wordsworth to write “The Egyptian Maid” (1835), an allegory of the Holy Grail. Pre-eminent among these was Alfred Lord Tennyson, whose first Arthurian poem “The Lady of Shalott” was published in 1832. Arthur himself played a minor role in some of these works, following in the medieval romance tradition. Tennyson’s Arthurian work reached its peak of popularity with Idylls of the King, however, which reworked the entire narrative of Arthur’s life for the Victorian era. It was first published in 1859 and sold 10,000 copies within the first week. In the Idylls, Arthur became a symbol of ideal manhood who ultimately failed, through human weakness, to establish a perfect kingdom on earth. Tennyson’s works prompted a large number of imitators, generated considerable public interest in the legends of Arthur and the character himself, and brought Malory’s tales to a wider audience. Indeed, the first modernisation of Malory’s great compilation of Arthur’s tales was published in 1862, shortly after Idylls appeared, and there were six further editions and five competitors before the century ended. La leyenda del Rey Arturo que es lo que se sabe. El rey Arturo , también conocido como Arturo de Bretaña, es un destacado personaje de la literatura europea, especialmente inglesa y francesa, en la cual se lo representa como el monarca ideal tanto en la guerra como en la paz. Según algunos textosmedievales tardíos, Arturo fue un caudillo britanorromano que dirigió la defensa de Gran Bretaña contra los invasores sajones a comienzos del siglo VI. Su historia pertenece principalmente al folclore y a la literatura, pero se ha planteado que Arturo pudo haber sido una persona real o, al menos, un personaje legendario basado en una persona real. Las primeras referencias a Arturo se encuentran en las literaturas célticas, en poemas galeses como Y Gododdin (colección de poemas elegíacos a los héroes del reino de Gododdin). El primer relato de la vida del personaje se encuentra en la Historia Regum Britanniae (Historia de los reyes de Britania), de Geoffrey de Monmouth, quien configuró los rasgos principales de su leyenda. Monmouth presenta a Arturo como un rey de Gran Bretaña que derrotó a los sajones y estableció un imperio en las islas británicas. En su relato aparecen figuras como el padre de Arturo, Uther Pendragon, y su consejero, el mago Merlín, además de elementos como la espada Excalibur. También menciona el nacimiento de Arturo en Tintagel, así como su batalla final contra Mordred en Camlann y su retiro posterior a la isla de Ávalon junto con el hada Morgana, alumna de Merlín. A partir del siglo XII, Arturo fue el personaje central de un conjunto de leyendas conocido como materia de Bretaña, en la que figura como personaje de numerosos romances en francés. Chrétien de Troyes añadió otros elementos esenciales a su leyenda, entre ellos la figura de Lanzarote del Lago y el Santo Grial. Después de la Edad Media, la literatura artúrica experimentó un cierto declive, pero resurgió durante el siglo XIX y continúa viva a comienzos del siglo XXI, tanto en la literatura, como en otros medios. De entre todas las versiones del relato, la más leída de las antiguas es La muerte de Arturo, de Thomas Malory, que es, en palabras de L. D. Benson, «la única obra literaria inglesa escrita entre Chaucer y Shakespeareque aún hoy en día es leída con renovado fervor y placer». Esta obra ha sido también una de las más influyentes en las adaptaciones cinematográficas. Fue Geoffrey de Monmouth quien estableció definitivamente la historia del nacimiento de Arturo. El monarca literario es hijo del rey Uther Pendragon (en galés, ‘Uther hijo del Dragón’), quien deseaba a Igraine, esposa de Gorlois, duque de Tintagel, esto desató una guerra entre ambos hombres. Uther hizo que el mago Merlín embrujase a la mujer para que, cuando él entrase a sus aposentos, ella creyese que se trataba de su esposo. Uther, aprovechando el engaño, mantiene relaciones sexuales con Igraine y engendra así un hijo: Arturo. Gorlois muere en combate esa misma noche, y los sabios de Cornualles aconsejan a Igraine que se case con el rey Uther. Al nacer Arturo, Merlín se lo lleva y lo entrega a un noble, sir Héctor para que lo cuide y lo críe como a su propio hijo, Kay. Según la mayoría de autores, Igraine y Gorlois habían tenido a Morgause, Elaine y Morgana, hermanas mayores de Arturo. Las dos mayores acabaron casándose con reyes britanos, pero la pequeña Morgana fue famosa por aprender magia suficiente como para ser llamada Le Fay, es decir ‘El Hada’. Algunos autores dicen que aprendió su magia en la Isla de Ávalon, otros señalan que fue alumna del mismo Merlín y la Dama del Lago, y otras versiones dicen que Morgana fue encerrada en un convento por su nuevo padrastro, Uther, y que ahí aprendió su magia. A los 18 años, Arturo va con sir Héctor y Kay a Londres, donde caballeros de toda Inglaterra intentan sacar una espada de su prisión en un yunque que a la vez se encontraba prisionera de un trozo de mármol(colocada por el Rey Uther). Se decía que quien la liberase sería el rey de Inglaterra y el encargado de unificar todos los reinos de la isla (Uther había muerto unos años antes). Infructuosamente, todos los caballeros intentaron extraer la espada, pero es Arturo, sin ser caballero aún, quien logra liberarla, y le es revelada su verdadera identidad. Con la resistencia de todos los presentes (en especial su cuñado Lot, esposo de Morgause), es proclamado rey, sin embargo, poco a poco todos lo aceptan y Arturo jura impartir justicia a todos los hombres de Inglaterra sin tener en cuenta su posición social. En estos primeros días de su reinado los autores suelen situar el incesto de Arturo y una de sus medio hermanas, del que nacería Mordred. Algunos autores lo suelen presentar como hijo de Arturo con Morgana Le Fay, pero Mallory y la Vulgata decían que Arturo se había acostado no con Morgana, sino con otra hermana, Morgause (En las primeras versiones Mordred es tan solo el hijo de una hermana de Arturo, solo es su sobrino, pero los autores fueron alterando el árbol genealógico con los siglos). Poco después Arturo pierde su espada durante una batalla. El mago Merlín lo acompañó a un lago en cuyo fondo había un castillo en el cual vivía una hechicera llamada Nimue, la Dama del Lago. Esta mujer guardaba una espada maravillosa, Excalibur. Arturo le pidió la espada y Nimue se la regaló. Merlín observó la espada mágica de Excalibur: «Guardad bien esta espada» le advirtió al rey, «puesto que mientras la llevéis no perderéis nada de sangre, pero un día llegará una mujer en la que confiáis y os la robará». Arturo fue ayudado por Merlín hasta que éste desapareció junto a su amada Nimue y fue encerrado por ella en una colina hueca. La medio hermana de Arturo, Morgana, aprovechó esta situación para robar la vaina encantada de Excalibur y arrojarla al mar. Morgana actuó así con Arturo debido al matrimonio que su hermano le había obligado contraer con el rey Uriens, y porque Ginebra, la prometida de Arturo, había expulsado de la corte a Guiamor, su amante. Durante la búsqueda del Santo Grial, todo apunta a que sir Lanzarote iba a encontrar el sacro objeto, pero su amor por la reina no lo hizo digno de tal premio. Cuando pasó una noche en el castillo de Corbenic, donde vivía el Rey que custodiaba el Grial, la hija de este rey, Elaine, se enamoró de Lanzarote, y mediante la magia, adquirió el aspecto de Ginebra para yacer con él. De ésta unión nacería Galahad, uno de los caballeros destinado a encontrar el Grial. Detalle de El último sueño de Arturo, pintura de Edward Burne-Jones, en la que se representa como Morgana y otras hadas velan por el sueño del Rey. Arturo sale en persecución de Lanzarote y deja el reino a cargo de su hijo Mordred, quien se apodera del trono e intenta seducir a la reina Ginebra. Al regreso de Arturo, él y sus caballeros deben luchar para recuperar el trono, en la Batalla de Camlann. Arturo se enfrenta a su hijo, al que atraviesa con su lanza. Pero Mordred, antes de morir, hiere fatalmente a Arturo, y muere. Muchos lugares se han señalado como la legendaria última morada de Arturo: según Chrétien de Troyes, fue en Cornualles; según Wace, en la Bretaña francesa, donde actualmente existe una Isla de Avalon (Íle de Aval, en el municipio de Pleumeur-Bodou); también se ha apuntado a una antigua fortaleza de Adriano en Cumbria: Aballaka o Camboglanna, actualmente denominada Castlesteads, en la desembocadura del Edén. También se ubicó según un conocido fraude en Glastonbury (en Somerset, Inglaterra)… Pero hay que señalar que los pueblos celtas llevaron sus leyendas y las transpusieron a sus lugares de emigración (esto explica por qué hay varios bosques de Brocelianda o varios Cornualles). El origen etimológico de la palabra Avalon estaría en la denominación celta bretona o galesa de una fruta: la manzana. Según otras versiones del final de Arturo este no murió, sino que tan sólo se retiró a Avalon. No está claro si este lugar designa realmente una isla o un valle que destacó en algún momento por su fruta y si contiene o no la tumba del rey muerto; como el propio Arturo, Avalon vive plenamente en la historia de la literatura y de forma múltiple y muy borrosa en la realidad. Metafóricamente no sería otra cosa que una representación del más allá. Si el ciclo artúrico inspiró en el siglo XIX numerosas obras de los prerrafaelitas, la muerte del rey supuso el mayor ejemplo, abordándola artistas como James Archer, Dante Gabriel Rossetti o Edward Burne-Jones, cuya última e inacabada obra El sueño del rey Arturo en Avalón, es uno de los mejores ejemplos: Arturo, mortalmente herido tras la última batalla contra Mordred, ha sido llevado por tres reinas mágicas hasta la isla de Avalón, donde permanecerá en un ensueño hasta que su presencia sea requerida de nuevo en la tierra. Vista de conjunto del caldero de Gundestrup, de origen celta. Como mito el Rey Arturo ha pasado a la iconografía popular como sinónimo de inteligencia, honor y lealtad. Su espada (Excalibur), un símbolo del poder legítimo. Su capital, Camelot, un lugar idílico de igualdad, justicia y paz. El hecho de que Arturo y sus caballeros se reuniesen en torno a una Mesa Redonda, parece indicar que Arturo era, conforme a la expresión latina, un primus inter pares, que significa ‘primero entre iguales’. El rey Arturo también fue un símbolo en la mitología alemana. En algunas leyendas se cuenta que Morgana era una bruja de magia negra, una nigromante y que ella misma con su magia negra mató al legendario Merlín; pero otras historias desmienten esta versión y presentan a una Morgana víctima de las circunstancias. Otras versiones dicen que Morgana era la Madre de Mordred, pero Arturo no era su padre, y a la Muerte de Arturo, Merlín se lo lleva al Otro Mundo, mientras que Lanzarote mata a Mordred y gobierna el país junto a Ginebra. También cuenta una leyenda que Arturo aún duerme bajo su país natal, oculto en una cueva, esperando que su pueblo lo vuelva a necesitar, y que hasta hoy los británicos esperan el regreso del Rey Arturo. La versión más extendida de la no-muerte de Arturo es aquella que cuenta cómo el Rey fue recogido por varias damas en una barca. Aquellas damas eran hadas que lo llevaron a la Isla de Ávalon, donde su hermana Morgana lo acostó en una cama dorada, y allí sigue, velando el sueño de su hermano pequeño. Mircea Eliade consideraba la leyenda de Perceval y del Rey Pescador como ejemplo de mito occidental tanto en lo que concierne al simbolismo y a los ritos del Centro, como a los temas iniciáticos. Por su parte Jessie L. Weston en su libro From ritual to romance (1920) indica que la búsqueda del Grial por parte de los caballeros cristianos era una desviada y sublimada versión de una religión pagana de la fertilidad, centrada en el mito de un impotente rey y su estéril reinado. El poeta T.S. Eliot reconoció la influencia de este libro en la composición de The Waste Land(1922). También influyó según reconoce Coppola en la creación de la película Apocalypse Now, donde además aparece sobre la mesa del coronel Kurtz (Marlon Brando), mientras el coronel recita el poema de Eliot “The hollow men”(“Los hombres huecos”). La leyenda de Arturo ha ido incorporando en sus distintas versiones elementos míticos de los celtas, uno de los más relevantes habría dado lugar al grial. El grial es parte de la mitología cristiana medieval, es decir que carece de referencias específicas en los textos bíblicos. Entre los diversos elementos que han entrado en la formación del mito, se encuentran las leyendas monacales con su contenido alegórico y las referencias, precristianas, a recipientes mágicos como el cuerno de la abundancia o los calderos del conocimiento de la tradición céltica. El Rey Uther e Ygraine entregaron a Arturo al Mago Merlín nada más nacer. Así la leyenda paso de boca en boca de generación a generación quedando el recuerdo del Rey Arturo para la eternidad. con la colaboración de las biblioteca de Inglaterra. Previous ArticleThe Secrets of Champagne, How should be Drink in. Los secretos del Champagne como se bebe realmente. Next ArticleGolden Diva’s of Dany Atrache, Dany ha creado Divas con valor en oro!! I am Bolt Film Review and critic, It’s worth seeing the movie? comentarios del documental, averigua con migo que te enseña la película.